PayPal Specific post/page buy now shortcodes limited to 20 pages? So glad to have support back! I am creating a buy now button for paypal express checkout. I have been troubleshooting for a week and finally figured out the issue. The shortcode stops working/sending to paypal once you surpass 20 posts/pages. Below, the first shortcode works, the second does not. The second shortcode (which is the one we need to use) gives the paypal warning "Things don't appear to be working at the moment. Please try again later." Nice work finding the problem! From what you describe, it's as if PayPal had a limit to how long that value can be... I'll need to dig in their documentation and figure it out. You're the first one I see used the Specific Post restriction to such an extent. It was originally thought for one or just a few more posts. Maybe when it's such an amount of content that you're selling, it'd make more sense to use the custom capability restriction? It does require the person to create an account, but this way you would both have more control. It may also be your only choice before I figure out how to work around PayPal's limitation (if that's what it is). Does that make sense for you, or are there strong reasons to avoid having them register an account? I see you have a Membership, so I assume you're not completely against it. Hi Kim @kimann What if you simply use the ccap and then that way in the future if you increase the membership posts you don't have to change all of your payment buttons too? 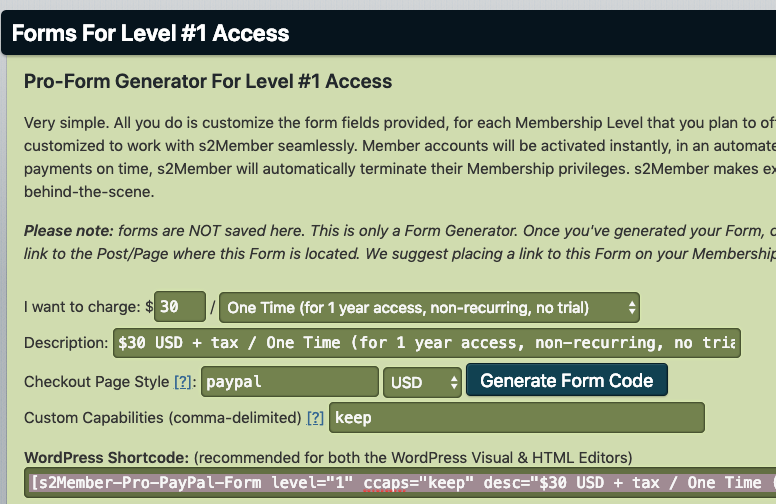 Within the registration shortcode, you just want to add "keep" to the custom capabilities. 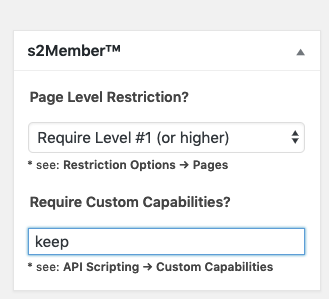 For the people that have already registered, in the Member's dashboard admin area, just add "keep" (without quotes) to their profile under custom capabilities. Hope this helps! It should make your life much easier! To clarify, make sure you have the registration payment shortcode include ccap="keep"
I wanted to clarify that the custom capability's name can be any length, doesn't have to be exactly 4 letters long. Thank you all- this is awesome. Just one thing, does this mean to access Keeper of the Garden that customers will have to login to the website? OH and will they subsequently then have access to all level 1 info? Yes, they'd need to identify themselves logging in to have their paid access. If they don't login, they'll be like any other visitor, and the site won't know who it is and can't give access to just any visitor if the content is protected. If you sell them Level 1, then they'll have access to content you protected at Level 1. Same for custom capabilities.